Directions: Preheat the oven to 375 degrees F and line muffin cups with paper liners. 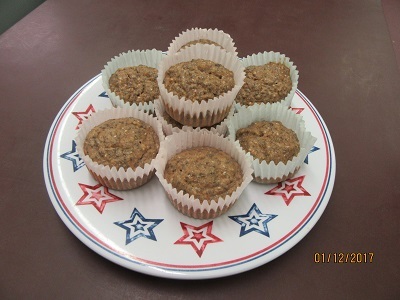 Grind the almonds in a food processor until they are finely ground like a flour or use store-bought almond meal. Whisk or beat together the almond milk, maple syrup, egg whites, vanilla, cinnamon, and salt. Add the ground almonds and chia. Stir until everything is combined. Pour the batter into paper-lined muffin cups. Bake for 20 minutes or until golden brown. With kitchen scissors cut cherries from pie filling into small pieces. Spread 1 tablespoon filling onto each triangle. Roll up, starting at shortest side of triangle, rolling to opposite point. Place point side down on cookie sheet; curve into crescent shape. Bake 12 to 15 minutes or until golden brown. Remove from cookie sheet to cooling rack; cool 2 minutes. Meanwhile, in small bowl, mix powdered sugar, vanilla and enough milk until smooth and desired drizzling consistency. Drizzle glaze evenly over crescents. Serve warm. These baked, not fried, doughnuts are a banana twist on an old favorite. 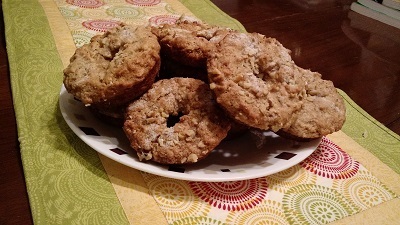 For variety, you can also sprinkle the finished dougnuts with cinnamon or roll them in confectioners’ sugar. The more ambitious cook might consider a chocolate glaze to make them really special. Lightly coat 2 baking sheets with nonstick cooking spray. Set aside. Combine the granulated sugar and nuts in a small bowl. Set aside. Combine RICE KRISPIES with the flour, baking powder, baking soda, and pumpkin pie spice in a mixing bowl. Set aside. Combine the egg whites, bananas, brown sugar, and oil in the bowl of a standing electric mixer and beat to blend. Add the dry ingredients and beat on medium speed until incorporated. Drop the dough, using a ¼-cup measure, onto the prepared baking sheets, forming each piece into a slightly flat, neat circle with a spatula. Using a small rubber spatula coated with nonstick cooking spray, create a 1-inch hole in the center of each circle. Sprinkle each “doughnut” with some of the reserved sugar-nut mixture. Bake in the preheated oven for 10 minutes, or until lightly browned around the edges. Remove from oven and transfer to wire racks to cool. Serve warm or at room temperature. Coat a 9x13 baking dish with cooking spray. 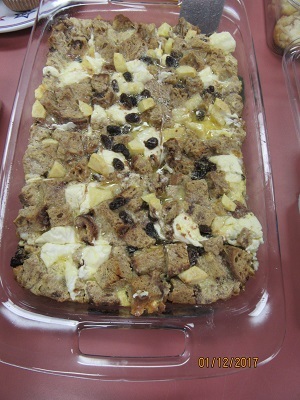 Arrange ½ of the cubed raisin bread in the bottom of the dish. Sprinkle the cream cheese evenly over the bread, and top with the apples. If you like extra raisins, add them now. Top with remaining bread.